I accept that I'm not going to come close to zero in the next month. Maybe, maybe, close to -25? But it gives me a goal to beat for next year. That's, um, good? I didn't quite finish the Advent calendar. It should be done, though unquilted, tomorrow. I did buy this little stack - my only Black Friday purchases. A yard of Grand Finale for Swoon borders and candy cane stripe to bind Rudolph and the Grinch. 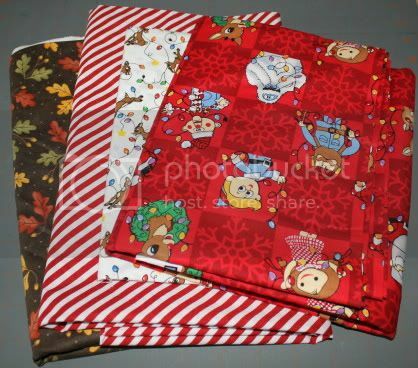 The Rudolph fabric came in the mail - one yard of the white for sashing, three yards of the red for backing and borders. I adore the red. It's going to be a great little quilt.